Just added this multi purpose hard shelled gourd. Perfect for a variety of crafts, birdhouses, hanging planters and much more. Nice smooth shell, beatiful mottling. Sizes range from 6" diameter to 9" diameter, to purchase options. Length ranges from 11" up to 15" long. 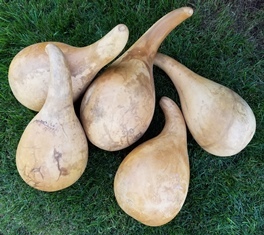 Each gourd sold separately, and as with any gourd, no two are exactly the same.